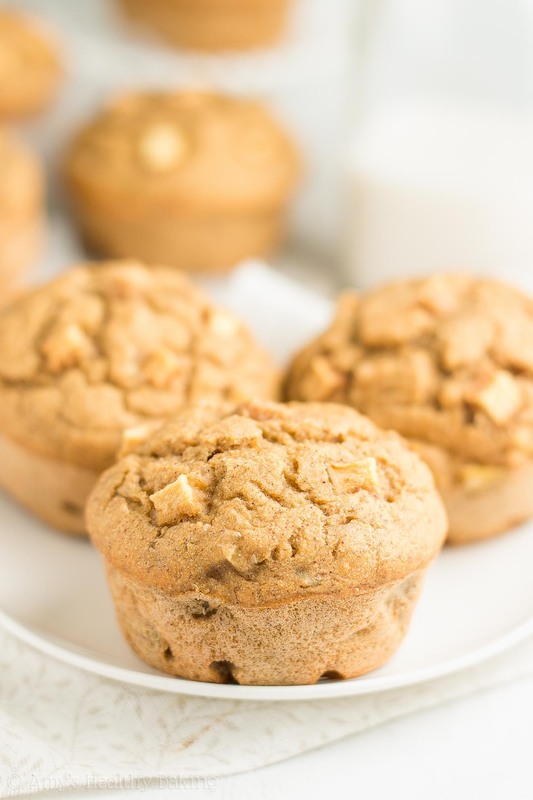 Learn how to make healthy banana muffins with this easy recipe! They’re full of sweet fruit flavor, lots of cozy spices & only 109 calories! Plus no refined flour or sugar! The next day when I logged onto my computer, I found dozens of comments and emails from you expressing your gratitude for sharing what I had written. I felt overwhelmed as I read every word you wrote, and I even felt a few tears well up in my eyes at some of your messages. Thank you for sharing your wonderful comments! Psst… If you’re completely confused about what I’m talking about, here is my blog post I’m referencing! 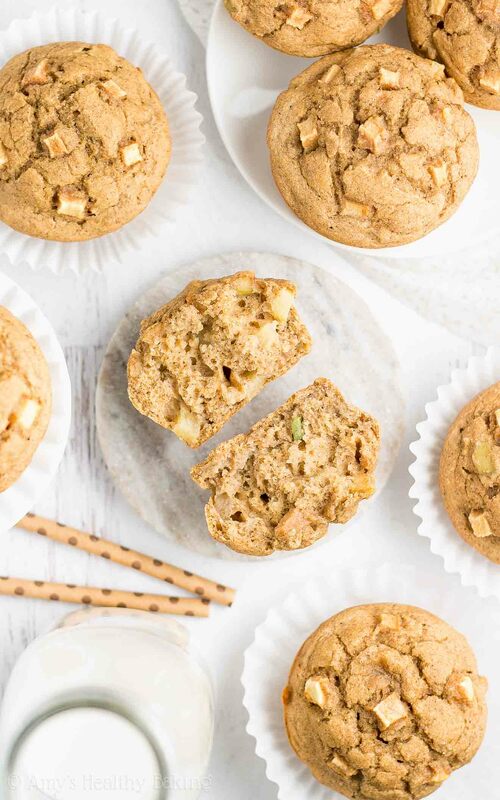 While I hope to share more blog posts like that in the future, I’m sticking with baked treats today… Specifically these Healthy Cinnamon Apple Banana Muffins! They’re full of sweet fruit flavor, along with the perfect amount of spice coziness, and they’re great for quick grab-and-go breakfasts or snacks. I’ve even been known to eat one as a pre-bedtime treat! In other words… They’re so good that they never last long in my house! ? 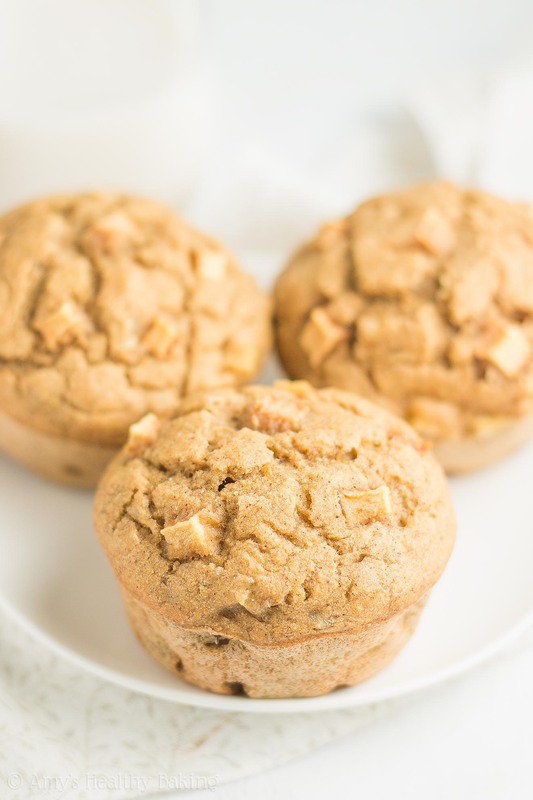 Let’s talk about how to make this easy banana muffin recipe! You’ll start with white whole wheat flour (like this!). It’s not a combination of white (aka all-purpose) flour and whole wheat flour… White whole wheat flour is made by finely grinding a special type of soft white wheat—hence the name! Regular whole wheat flour comes from a heartier variety of red wheat instead. 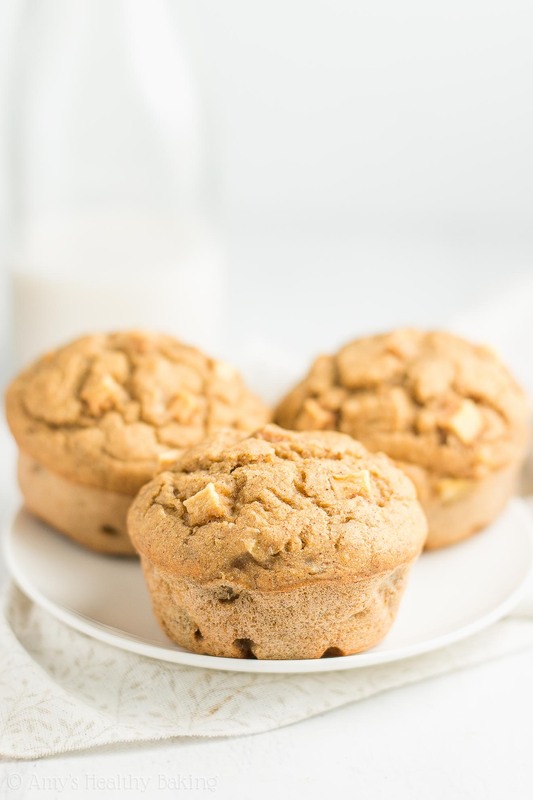 This gives white whole wheat flour a lighter taste and texture, which lets the fruit flavor truly shine in these healthy banana muffins! Of course, we can’t forget the spices that need to be whisked into that flour! You’ll use both cinnamon and allspice. This is my favorite cinnamon because it tastes stronger, warmer, and a bit sweeter than regular jars. As for the allspice (this stuff! ), it’s a single spice—not a blend! It’s named because it tastes like a combination of cinnamon, nutmeg, and cloves. 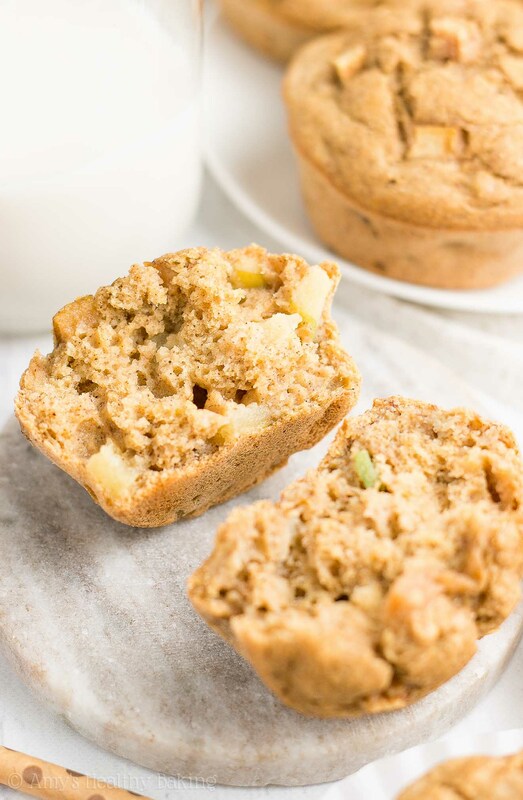 The allspice really rounds out the spice flavor in these healthy banana muffins! With just 1 teaspoon of melted butter or coconut oil, the rest of the tender texture comes from two ingredients: Greek yogurt and mashed banana. If you’ve been around my blog for a while, you know how much I love including Greek yogurt in my healthy baking recipes! It adds the same moisture as extra butter or oil for a fraction of the calories, and it gives your treats a protein boost, too! Nerd alert! The mashed banana actually plays 3 roles! Flavor (obviously! ), tender texture (just like the Greek yogurt! ), and natural sweetness. See those bananas above? Nerd alert #2! 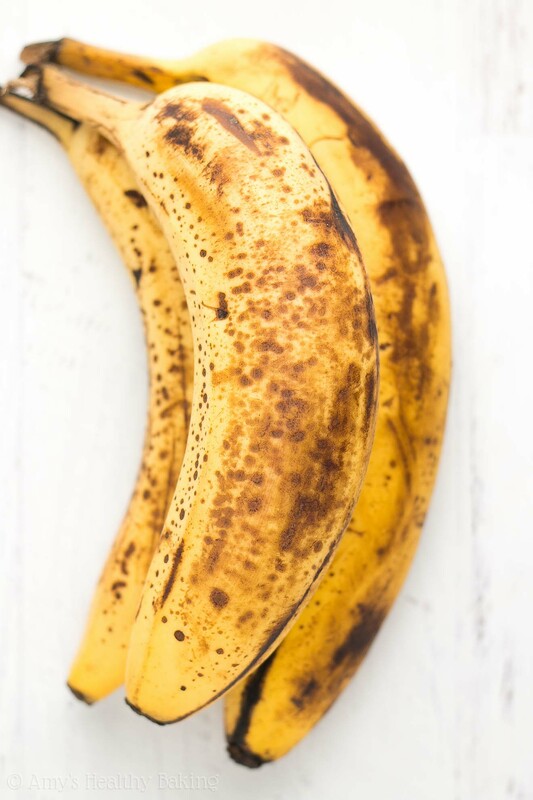 This healthy banana recipe includes a funky ingredient… A small amount of vinegar! Just an itty bitty bit—I promise you can’t taste it! The acid in the vinegar reacts with the baking soda to help these muffins rise and achieve a more tender texture. It’s a secret trick of mine in my ultimate healthy banana bread recipe, too! For the second fruit component, you’ll need finely diced apple. I highly recommend red Fuji apples! They’re my favorite for baking because they have a nice firm texture and lots of natural sweetness. Make sure you cut them to be no larger than the size of chocolate chips to ensure your muffins bake evenly! I always reserve some pieces to press into the tops of the muffin batter just before baking… I think it makes them look really cute and inviting, don’t you? 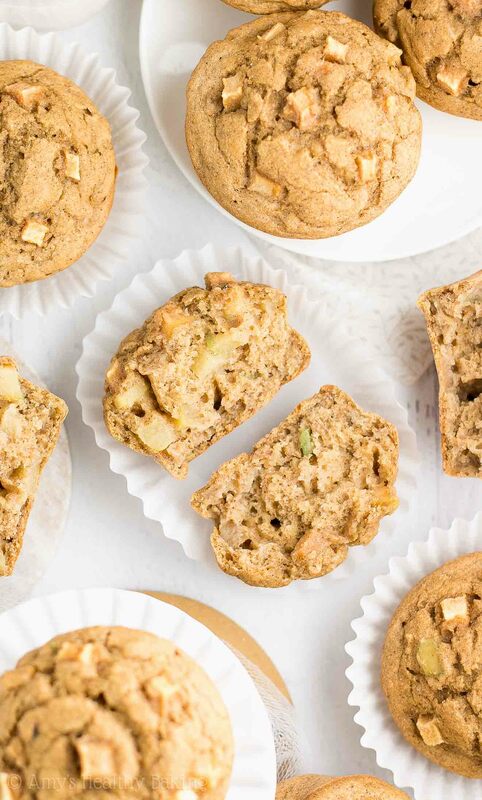 Ready to bake these healthy apple banana muffins? ?? And when you make your own, remember to snap a picture and share it on Instagram using #amyshealthybaking and tagging @amyshealthybaking IN the photo itself! (That guarantees I’ll see your picture! ?) I’d love to see your healthy muffins! 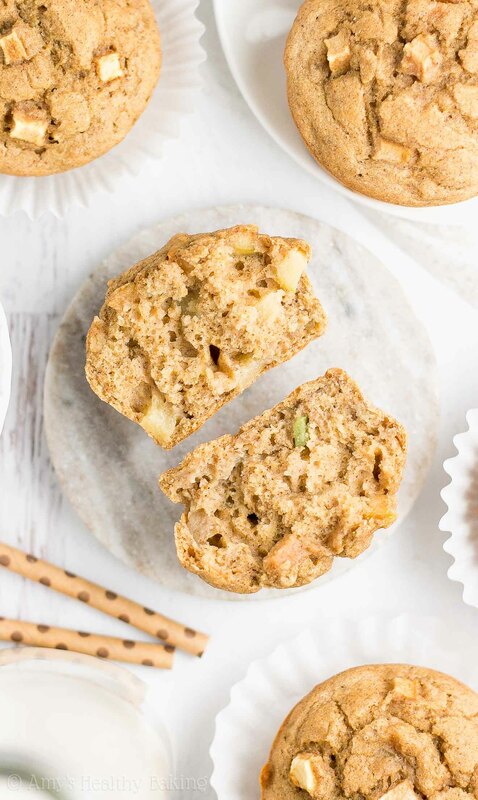 These healthy muffins are great for quick grab-and-go breakfasts and snacks! They’re really tender with lots of sweet fruit flavor and the perfect amount of cozy spices. Leftovers will keep for at least one week if stored in an airtight container in the refrigerator. Preheat the oven to 350°F. Lightly coat 12 muffin cups with nonstick cooking spray. In a medium bowl, whisk together the flour, cinnamon, allspice, baking powder, baking soda, and salt. In a separate bowl, whisk together the butter, eggs, vanilla, and vinegar. Mix in the Greek yogurt, stirring until no large lumps remain. Mix in the mashed banana and maple syrup. Alternate between adding the flour mixture and milk, beginning and ending with the flour mixture, and stirring just until incorporated. (For best results, add the flour mixture in 3 equal parts.) Set aside 2 tablespoons of the apple, and gently fold in the rest. Divide the batter between the prepared muffin cups, and gently press the remaining apple into the tops. Bake at 350°F for 18-21 minutes, or until the tops feel firm to the touch and a toothpick inserted into the center comes out clean. Cool in the pan for 5 minutes before carefully transferring to a wire rack to cool completely. Notes: For the gluten-free flour, use as follows: 1 cup (120g) millet flour, ½ cup (60g) tapioca flour, ½ cup (60g) brown rice flour, and 1 ¾ teaspoons xanthan gum. Many store-bought gluten-free flour blends (like this one!) will also work, if measured like this. The mashed banana and Greek yogurt combined need to measure 1 cup. If you have slightly more than ¾ cup mashed banana, then reduce the Greek yogurt by the same amount, and vice versa. For sweeter-tasting banana muffins, substitute 1-2 tablespoons of maple syrup for an equal amount of milk. I use red Fuji apples because they have a great texture for baking and are naturally very sweet. I’ve baked a lot of muffins in my many years. While these were ok, I felt they were lacking in flavor. Need more banana flavor for one, also felt they weren’t sweet enough. I don’t like muffins that are too sweet, but these could have used more. They actually tasted a little bitter. Good color and texture though. I would try this recipe again but I would definitely make some changes. Made these today (5x); they were nice! Though I understand what the earlier poster said in that the flavors blend together so completely, yet subtly, that somehow they just don’t stand out with pizazz. Still nice muffins, though. I’m truly honored that you’ve been making many of my recipes Marianna! That means the world to me! 🙂 As always, thanks so much for taking the time to let me know!